TeamSpeak automatically detects what recording devices your computer has. They are listed in the Settings --> Options -->Sound Devices under Device. Here you can choose your preferred device. Try by trial and error what works best for you (e.g. I found out that my headset and soundcard recording worked better than my usb webcam recording) Note that if there are only 2 options there (one being the “primary driver....”) it doesn’t matter which one you choose. In this dialogue-box you can also see what kind of recording you are using. There are two kinds of recording: Wave and Direct Sound. The first one generally delivers the best sound quality and the latter the lowest latency (depening on the quality of your soundcard). 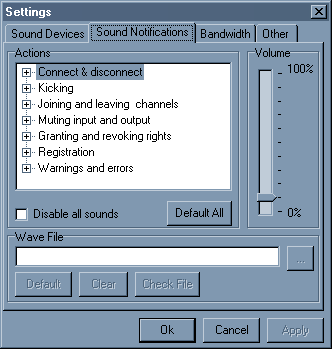 The default is set to Direct Sound. When switching between those two it is sometimes needed to restart TeamSpeak (when you get an error message) in order to get it working properly. DirectSound has a slider which controls the sampling buffer size. When it is to the utter left one has the lowest latency (one can hear eachother with the least amount of timelag). When the slider is to the utter right you will have the same quality and timelag as Wave recording. When people on your server complain you are just sending “noise” but you can hear them fine, you are probably using DirectSound. Try sliding the slider to the middle or right position. Most of the times this seems to solve this problem (this problem occurs because not all soundcards are capable of sampling really short bits of sound, with the slider in the middle or right those samples are a bit bigger and hence solve the problem). Note: Windows XP users are generally better off using wave recording. W98 users should use DirectSound. If you have a onboard soundchip (a soundcard integrated on your motherboard) and people can't hear you on the server but you can hear them just fine, it is probably because your soundcard isn't capable of recording in 16 bit (although your manufacturer might claim it can). 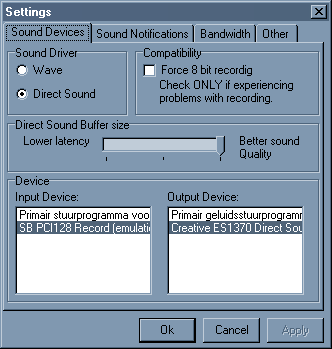 Of course we have a solution for you and you can try and check the box at compatibility called "Force 8 bit recording". 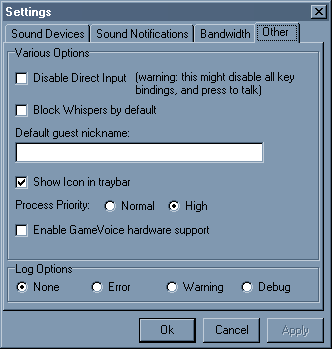 TeamSpeak has an extensive set of sound notifications. They all are pretty much self-explanatory. The volume slider on the right controls how loud these messages are played when something happens. These sounds are completely adjustable. If you want to use your own sounds here you just choose and event fill in the file you want to play (with the “...”button you can browse your computer for the file). You can check wether the file is good by pushing the “Check File” button. If you decide that the file is not good enough, you can revert to the default sound by pressing the “Default” button. If you are annoyed by all these event sounds you can check the “Disable all sounds” box. 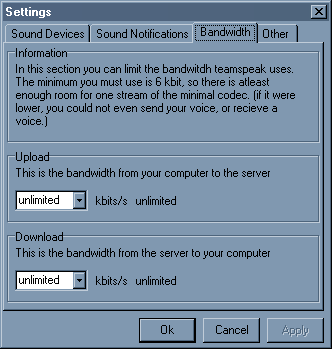 In this tab you can set the bandwidth used by the TeamSpeak client. Like it says in the Information you can set it to 6 kilobit for minimal bandwidth usage or unlimited for unconstrained usage of bandwidth. Note that 6 kilobit is the bare minimum for the client to work ( the lowest codec, Celp 5.1, uses about 6 kilobits per second; down and up). If the channel of your favorite server uses the 16.4 kilobit you will need to set the bandwidth to 17 kilobit in order to make the client recieve and transmit sound. This function is meant for low bandwidth users that want to constrain their bandwidth. In the current architecture of TeamSpeak if multiple people in your channel talk, the bandwidth will double (if 2 people talk at the same time) or triple (if 3 people talk at the same time). If you are experiencing lag in your games while running TeamSpeak you can lower the bandwidth TeamSpeak uses. The most useful here is to set a limit for the upload bandwidth, set it to the first higher number of the codec your favorite channel uses ( for GSM 16.4, set it to 17 kbits). Experiment a bit to find the optimum setting for your case. There are a couple of presets in the dropdown menu, however you can type in your preferred upper limit of bandwidth too. When you enter a value, the bandwidth in KiloBytes is shown on the right. Click on Ok to make the changes permanent or Cancel to cancel the operation. You can try disabling direct input when you are experiencing troubles with keybinds ingame. If you don’t want to be “whispered’ at you can check the "Block Whispers by default" box. You can set a Default guest nickname, this is handy when you connect to a server using the webbrowser login (e.g. teamspeak://my.server.com). You can choose wether you want an icon in the traybar by checking the box. If you are experiencing “choppy” sounds while playing a game (e.g. when your harddisk shows some activity) set the Process Priority to High and restart TeamSpeak. If all went well you shouldn’t experiencing those choppy sounds anymore.If you are the owner of a GameVoice puck you can use it but you will have to enable: Enable GameVoice hardware support. If you do not have such hardware leave it unchecked. If you are experiencing problems with TeamSpeak you can choose to have the client log all actions. Our coders can take a look at the log if you post it on the TeamSpeak forum and might be able to fix your bug or problem. We at TeamSpeak highly encourage you to do so. The only way to make this program even better is with your help and bug reports.